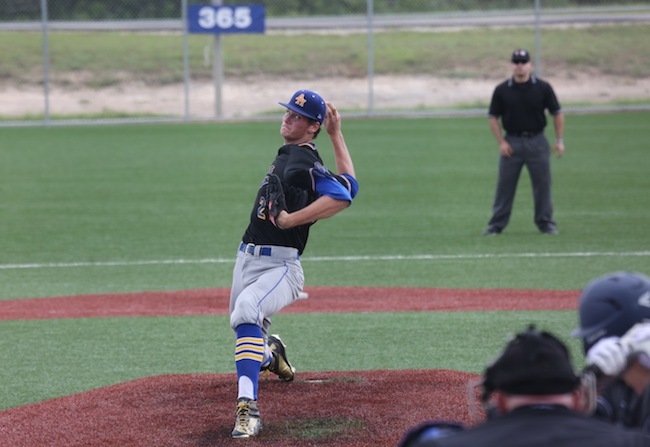 In the third inning of the Texas Class 5A State semifinal in early June, news started swirling around Dell Diamond in Round Rock. Alamo Heights senior Forest Whitley, the San Antonio native who was on the mound, had been drafted 17th overall by the Houston Astros. Soon after the selection, Forrest's father, Matt, quickly ran towards the dugout and alerted a teammate, who then relayed the message to the newly drafted pitcher. Less than two weeks later, Forrest signed his contract and received a $3.148 million bonus, then reported to the Astros Gulf Coast League affiliate in Kissimmee, Florida. The draft overlapping his school's first ever trip to the state tournament resulted in a unique situation. However, Forrest made it all happen well before he stepped on the field on that unforgettable night in Round Rock, Texas. When Forrest began playing baseball, getting drafted wasn’t even in the realm of possibility. In fact, Whitley quit at the age of nine, only to come back at 10 because he missed playing. Instead of doing everything they could to get Forrest drafted, like they did with Preston, his parents decided they’d stand back and allow Forrest to make things happen. Forrest took it upon himself to make sure he had every chance to improve. He begged his dad to play travel baseball, and at age 14, asked if he could take lessons with Trinity University pitching coach David Smith. This past summer, Forrest was invited to play for the United States’ 18U Team. At the Tournament of Stars, a round-robin in which 108 of the nation’s best players are invited to face each other, Forrest started standing out. Whitley went on to make the national team and won the gold medal at the World Baseball Softball Confederation World Cup in Osaka, Japan. Coming back from Osaka, Whitley weighed 263 pounds. He decided that to reach his full potential, his eating habits had to change. The results are hard to miss, as Forrest now weighs 220 pounds and stands at 6’7”. He holds a commanding presence on the mound, with his fastball sitting in the low to mid 90s, topping out at 97 mph. Thinking about the Draft As Whitley began to dominate high school, universities began to notice. In September of 2014, Whitley received 27 Division I offers. Still not thinking the draft was in his future, Whitley committed to Florida State University. However, as he participated in events such as the Under Armour All-America Game, Whitley started to envision all the possibilities for his future. Although Whitley began to garner more attention, his mind was still set on college. It wasn’t until recently, when scouts swarmed every start, and projections had him going in the first round, that the draft became a real possibility for the family. Earlier this year, Forrest broke his thumb and missed a few games at the beginning of the season. When he returned, he dazzled the dozens of scouts who came to every game. Including the state semifinal game, Forrest went 10–1 with a 0.28 ERA, and he struck out 137 batters in 74.2 innings. Everything Forrest had worked for culminated in one night. At the same time he was pitching in his school’s first state tournament appearance, MLB commissioner Rob Manfred called his name in the draft. Whitley began playing baseball to be like his brother. After pitching his team to a win to qualify for the state final (where the team later lost), it was fitting that it was his brother, Preston, who presented Forrest with an Astros T-shirt and hat on the field. It capped off a memorable end to his high school career while marking the beginning of his pro career.